Hi! I have been specializing in family photography in Vancouver for the past few years and have learned a lot about what it takes for a successful family session. I have found that the following tips can make a huge difference in the results of the photos as well as the session experience for the family. The best time of day for family photos is either in the morning or evening when the light is soft and flattering. At this time of day, when the sun is low in the sky, the light has a soft, magical, warm glow. In contrast, the lighting conditions at midday are intense and harsh, making it a poor time of day to photograph. The midday sun can create strong highlights and dark shadows on the person's face. With the overhead direction of the sunlight, this can also create "racoon eyes". Furthermore, the bright, intense conditions are generally uncomfortable for the person you're photographing and can cause squinty eyes. Please visit my blog post here to see an example of the light at midday versus the evening. Identifying a location is a key consideration in planning a family photo session. Find a place that’s meaningful – A place that has sentimental meaning can be a great place for a family session. For example, a local beach or park that's a favourite place for your kids to play. Photos captured at a sentimental location will mean that much more when you hang them on your walls. Has some shade – A shady spot can often provide the best lighting conditions when the light is harsh on a bright sunny day. A quiet place – crowded places can be some of the worst places for family portraits. You’ll be constantly waiting for people to move out of the frame and all of the onlookers may make you feel self-conscious. 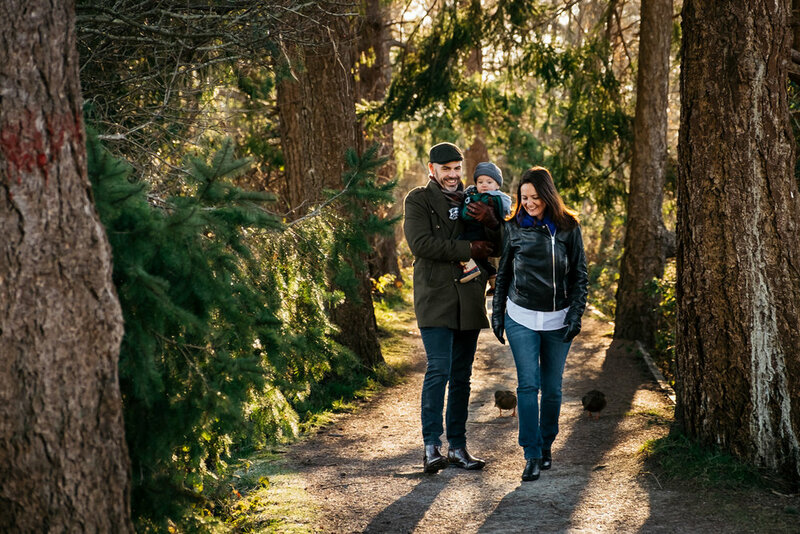 Please visit my blog post here for some of my favourite locations for family photos in Vancouver and the Lower Mainland. Preparation is so important for family photos, especially when you have little ones. What to wear - Ideally, it’s best to wear something that is comfortable and makes you feel good. Stay away from clothing with large logos or busy graphics. And of course watch out for outfits that might clash. Rather than match perfectly, think of having everyone wear something that goes together in a natural, yet not overly obvious way. Pick two or three main colours and pick clothes that fit that colour scheme. Solid, neutral colours with a pop of colour works well. Go for classic, not trendy. Well rested and well fed - Happy kids (and parents) are well fed and rested. Schedule your session around naps, have a good meal beforehand and bring snacks for the kids. A dark blanket (No patterns) - I might ask you to sit down so that I can shoot from a higher angle. If you’re concerned about your outfit getting wet or dirty, bring a blanket or something small you can sit down on. Extra clothes – With the little ones sometimes dirt/spit- up/food happens. It’s a good idea to have a backup set of clothes. Favourite toy – Your child’s favourite toy is always a great addition! Snacks and water - If your kids need a little mood boost during the session, a snack and water break can go a long way! Forget that I'm there! Not looking at the camera is super important if you want to capture those authentic, candid moments (My favourites!). I know it’s a bit awkward at first, but come prepared to act naturally and interact with each other like your not being photographed. This is truly the takeaway. Having fun during your session produces the best photos and enhances your experience. Play with your kids – Be playful and enjoy yourself as a family. Come ready to tickle, hug, joke, laugh, kiss and play. This allows me to capture those real, authentic moments. Enjoy the time with your family, this will result in great, natural photos. Try not to get frustrated - If you are stressed and frustrated, the kids will feed off this energy and get worse. If you stay calm and have fun, the rest will follow. Come with an activity – An activity that the whole family can enjoy is a great way to get authentic family photos and keep kids engaged (and happy!). Think of some fun games - Games are a really great way to infuse some fun into a photo session. For example, I often play Simon Says with my families, which is a really fun game that encourages the family to interact with each other. Thanks so much for taking the time to read my post! I hope it was helpful in planning your next family session. Please feel free to get in touch with me if you have any questions using the below form, or send me a message at info@davideklof.com.